It's that time of year again...our annual Zombie Fest program at the library. I was doing some hunting through a random drawer in my office today and came across the info for my very first Zombie Fest. That was way back in 2010! This will be my sixth annual event! Crazy how time flies, and even crazier how the program has morphed throughout the years. The first event was huge. We had over fifty teens stay for the fun, and to be honest, it was too many. Other programs work well with those kinds of numbers, but there's something about "zombies" that get kids super excited and ramped up. Should be fun! 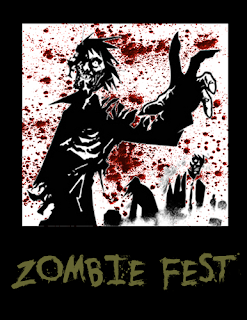 We also have fun goodie bags to hand out at the end of the evening with zombie paraphernalia and candy. We always like to send them home with a little something. Did you plan anything fun for Halloween?